All artwork tells a story… This juried exhibit showcases 23 Artists' work accompanied by a thoughtful dialogue on how each artist communicates a story through their artwork. We hope you will enjoy the many stories that are revealed in this vibrant exhibit! Jeff Madison creates vibrant worlds for us to experience from inside his imagination using his own photography and digital manipulation skills. Michael Moody lets his story unfold on the surface of his paintings with no set agenda-- he allows himself to be inspired by the shape and size of the canvas and every mark that has come before. Diana Godfrey creates a feeling of atmosphere within her artwork as the layers of the piece build up. Her story comes alive in the viewer's response to color and texture. Barbara Conte-Gaugel is drawn to things old rusty and ordinary that once had a purpose – it is through giving these items and images new context that she builds a story for the viewer to read and experience. -$6.00 Parking in Lot behind Ale’N Angus, entrance from Montgomery St. 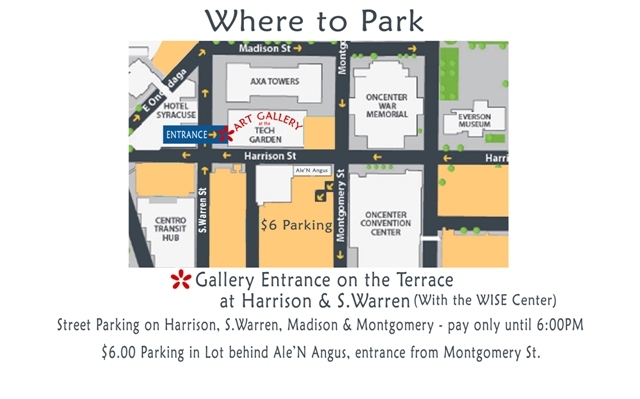 The Tech Garden Art Gallery will host a public Meet-The-Artists reception to Celebrate the Onondaga Art Guild’s 50th Anniversary Exhibit. The artwork in the exhibit has been judged and awarded recognition by Curator and Artist in Residence, Kristina Starowitz. The Exhibit showcases the work of 32 Guild Artists representing a variety of mediums from watercolor, oil paintings and sculpture. The Onondaga Art Guild has been in the CNY Community for 50 years! This is a group of artists who have found advantages in banding together for strengthening the interests of art in our community. Carol Adamec, for her sculpture "Embracing Differences"
Ignite the Spirit! 20 Women Artists of Central New York has been a great success! Over 150 visitors attended the opening reception on April 3rd, kicking off the 2014 Gallery Season! The Exhibit has, to date, raised $149 for Vera House through art sales and donations. The Artwork in this exhibit spans painting, drawing, metalwork, collage and a variety of subjects – Something for Everyone! Some of the featured artists include; Deborah Walsh- who creates extremely detailed and highly expressive classic car paintings, Clare Wilson- metal worker specializes in metal collage work, and Mary Fragapane- whose work brings to life female figures that inhabit a haunting, dreamy and ethereal quality. Ellen Haffar’s colorful pastel and acrylic work can aptly be described as Juicy! Her light on dark mark-making takes on a 3-dimensional feel, enhanced by frames that give the impression you are looking out a window into the world of a divine garden. Karmin Schafer Hansen shares 5 works from her “White Shed” series in this exhibit. These other-worldly images take on the feel of a portal or divine object. The inspiration Karmin had observing white target boards at a target range in Jamesville, NY for these pieces is a testament to the way artists see beauty in the world and translate it for the rest of us to enjoy! Her appreciation of the way the white boards took on and brought out all the colors around them produced her artistic vision for this wonderful series. Patricia Elliot Seitz produces beautiful landscapes of both Central New York and California. Her work includes a great deal of “knife-work” mixing colors and scraping them artfully onto the canvas to create breathtaking contrasts in her sky and sea scapes. Let us know you're coming! Click Here to RSVP! Join us for refreshments as we Celebrate these wonderful artists and their artwork! Enter to Win tickets to The Glass Menagerie at the Syracuse Stage! 10% of All Artwork Sales on April 3rd will go to Support Vera House during their White Ribbon Campaign. Mingle with the Artists & WISE Members as we kick off the WISE Symposium! The Artwork in this exhibit spans painting, drawing, metalwork, collage and a variety of subjects - Something for Everyone! Some of the featured artists include; Deborah Walsh- who creates extremely detailed and highly expressive classic car paintings, Clare Willson- metal worker specializes in metal collage work, and Mary Fragapane- whose work brings to life female figures that inhabit a haunting, dreamy and ethereal quality. The Art Store, providing workshops and supplies to artists and creativity seekers of Central New York.